Set oven control to broil. Spray cookie sheet with cooking spray. Place fish fillets on cookie sheet. Sprinkle both sides of fillets evenly with salt and 1 teaspoon of the pepper. Broil about 10 to 15 minutes until fish flakes easily with fork. Meanwhile, in large skillet, melt butter over low heat. Add garlic and remaining 1/2 teaspoon pepper. Cook and stir until garlic is fragrant. Add wine; heat to boiling over medium-low heat. Boil until sauce is reduced by half. Stir in whipping cream and basil. Simmer until thickened. To serve, place broiled grouper on individual plates. Top with cream sauce. 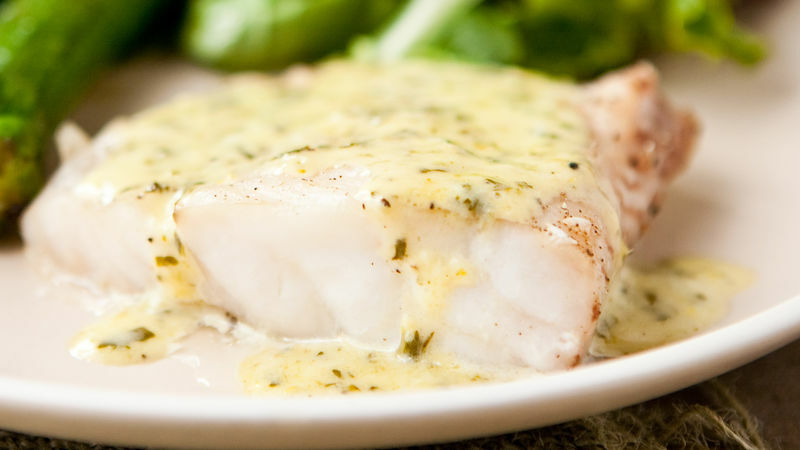 Other mild-flavor, firm-textured fish fillets, such as halibut, can be used in this recipe. Cut large fillets into serving-size pieces before broiling. Broiling time will vary depending on the size and thickness of fillets. Measure the fish at its thickest point and cook 10 minutes per inch of thickness.